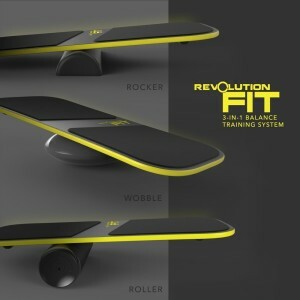 Yellow Revolution FIT is a 3-in-1 great performance balance board that gives you the new dimensions in your workout. 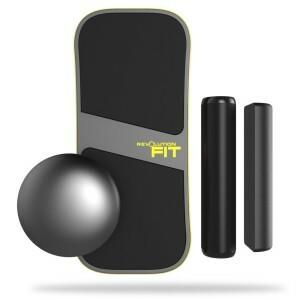 3-in-1 means it has the high grip roller, high density foam rocker and inflated wobble cushion in one (plus the balance board itself) and is suitable for use by people at all levels of fitness including advanced fitness people and athletes, for those that wish to use a balance board in their exercise, fitness and yoga routines. The main benefits are improving your balance and core muscle groups, as well as reflexes, stability and recovery after a workout and FIT offers a more flexible balance training experience than other products on the market, it will add a proper burn and challenge to your workout routine. Soft grip design makes your exercise feel better and it is a great quality product with high end build- is made in USA, unlike most other products that are made in China these days, not that we have anything against them as they can also be quite all right too. When you’re first starting out with Revolution FIT you should use a mat or a carpet underneath- will be easier for you than a hard floor then you can move on to a harder surface when you feel better about using the unit- it may take a little time to get used to even the easiest one of the three. Laminate board is relatively heavy and has a kind of a rubber-like soft and thick pad on top for better grip. You won’t find a DVD or booklet for the range of exercises you can do on this unit but internet is full of them so a simple Google search will give you quite a few results. You will soon realise that it is not just for improving core muscles but even your unexpected muscles with that pleasant sore feeling- you may feel the burn on your knees and more. The board doesn’t have a centre rail underneath like other balance boards on the market so you can change between the three platforms and also use them at different angles and try and balance on different surfaces. The semi cylinder rocker platform is a little slippery but feels kind of strong and durable and can make the board slip a little out of its place and the board itself can carry a maximum user weight of 350 pounds as it is made of ultra strong hardwood. FIT is very well made, has a premium feel with an attractive design with more footroom (board size is 32 x 14 inches), is solid and durable, and is quite a fun balance board offering versatility to use on a daily basis to even relax when you’re listening to music before bed at night. And you can use it with or without shoes as the top surface is comfortable enough. It is not a very low cost balance board set but with all the features, functionality and build quality it looks like a quite good value product.